When it comes to email management strategies utilizing SharePoint, there are two big realities businesses are continuing to grapple with. The first is that more and more work is being done on mobile devices. The second is that email remains home base for many employees. In fact, according to a study conducted by the Radicati Group, email traffic continues to grow by almost five percent each year and is projected to continue doing so for some time, despite the uptake of Teams chat. 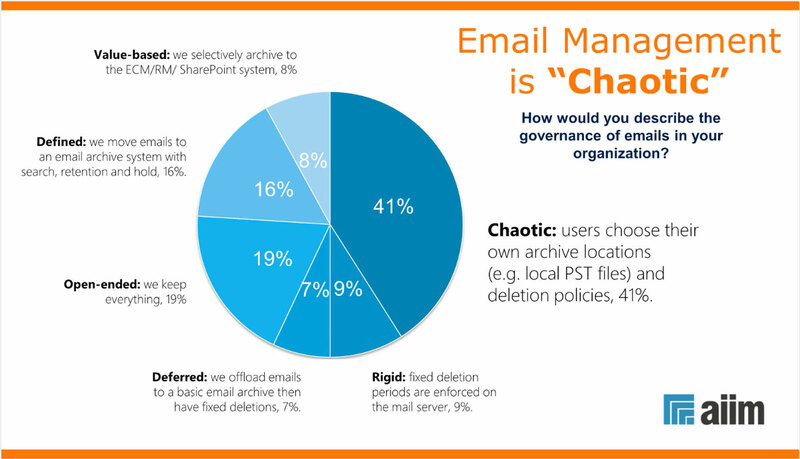 The important question for enterprises today is: How are they managing email? According to a recent AIIM study, most users choose their own archive locations and which files they delete. With one in four emails containing an attachment, email systems are becoming bloated and the content is largely unmanaged. This, in turn is increasing companies’ exposure to potential data breaches, and constraining collaboration and knowledge management. The problem is only exacerbated when you consider that most emails are checked first via mobile and often on personal devices. So how do enterprises create an email management strategy that maintains business compliance, without impacting productivity? Colligo asked Research Director Chris Marsh from 451 Research about some emerging trends to consider when setting your email management strategy for 2019. According to Marsh, in the mobile era, the workplace tools enterprises choose and how they use them is now a strategic choice. It’s important for companies to spend time crafting a vision for how they want data to be managed across traditional PCs and mobile devices, utilizing cloud-based applications and infrastructure. In order to get this right, there’s one vital question every organization must ask. How much do your employees love the tools they’re using? B2B business tools normally achieve a Net Promoter Score (NPS) of between 20 and 30, while leading consumer applications achieve an NPS of 50 or higher. Marsh emphasises this has to be considered when choosing your tools and strategy, if you don’t want employees using unsanctioned technologies and taking information out of approved channels. So what are employees seeking from email management tools? And what motivates employees to adopt and use the tools that IT leaders are considering? According to Marsh’s team, providing autonomy for employees to work how they want is key, and that includes in applications they like. AIIM research validates what Marsh observes – that email remains at the heart of how people work both as autonomous workers, often on the move. So, the challenge is… How can we bring data compliance to where employees are – in Outlook and working mobile? 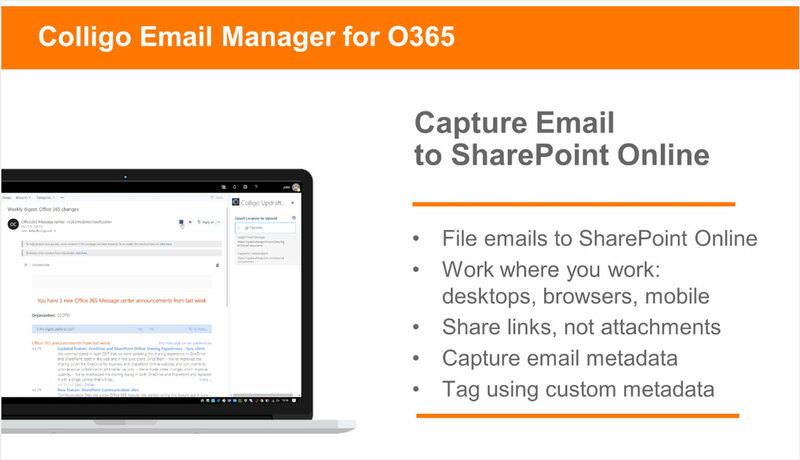 One proven solution is Colligo Email Manager for Office 365, which lets employees capture emails and attachments from Outlook and save them directly to SharePoint without leaving their inbox. As Marsh noted, companies have to make compliance process usable, or employees will find a way around. It’s also imperative that metadata be applied when it is created or received to preserve the value of information. Just as Marsh prescribes, as soon as employees click to save email content to SharePoint from Outlook, Colligo prompts employees to tag emails and email attachments with metadata, labels and retention dates for rapid search and data compliance. By bringing information governance into email management and through to SharePoint online, employees can work anywhere they can access Office 365, with the same familiar experience. Request a demo of Colligo Email Manager today and learn how to create an email management strategy for data compliance in SharePoint that your employees will actually use.